The discovery creates a path for developing gene editing approaches for treating SCD and other hemoglobin disorders, such as thalassemia. This stretch of DNA, called an enhancer, controls the molecular switch BCL11A. This switch, in turn, determines whether a red blood cell produces the adult form of hemoglobin--which in SCD is mutated--or a fetal form that is unaffected by and counteracts the effects of the sickle mutation. Other studies indicate that sickle cell patients with elevated levels of fetal hemoglobin have a milder form of the disease. The new study--led by Stuart Orkin, MD, and Daniel Bauer, MD, PhD, of Dana-Farber/Boston Children's, and Feng Zhang, PhD, of the Broad Institute of MIT and Harvard--was spurred by the discovery that naturally occurring beneficial variations in the DNA sequence in this enhancer dial down BCL11A only in red blood cells. To mimic and improve upon the effects of these variations, the research team used recently developed CRISPR-based gene editing tools to systematically cut out tiny sections of DNA step-by-step along the entire length of the enhancer in blood stem cells from human donors. They then allowed the cells to mature into red blood cells and found that the amount of fetal hemoglobin the cells produced had increased substantially. The team's experiments revealed a specific location in the enhancer that when cut leads to production of high levels of fetal hemoglobin. Parallel experiments in an animal model revealed that removal of this part of the enhancer affected BCL11A's expression only in red blood cells, not in immune or brain cells, where BCL11A is also active. These findings show that the effects are restricted to red blood cells, and that other cell types are unaffected. "There was no efficient way of conducting this kind of experiment until now," said Bauer, a pediatric hematologist/oncologist at Dana-Farber/Boston Children's. "Our goal was to break the enhancer, rather than fix the hemoglobin mutation, but to do so in very precise ways that are only possible since gene editing technologies like CRISPR became available." Interest in exploring the potential clinical uses of the BCL11A switch has grown since Orkin's laboratory revealed its direct role in the transition from fetal to adult hemoglobin in Nature in 2009. Another important step came in 2013, when the journal Science published their report of the discovery of the enhancer that directs expression of BCL11A only in red blood cells. "We've now targeted the modifier of the modifier of a disease-causing gene," explained Orkin, a leader of Dana-Farber/Boston Children's who serves as chairman of pediatric oncology at Dana-Farber Cancer Institute and associate chief of hematology/oncology at Boston Children's Hospital. "It's a very different approach to treating disease." The data provide proof of principle that targeted edits to BCL11A's enhancer in blood stem cells could be an attractive approach for curing SCD and related conditions. 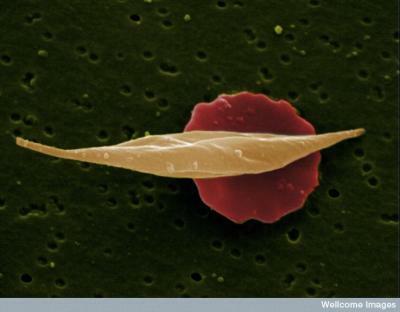 "These experiments may have revealed the genetic Achilles heel of sickle cell disease," said Orkin. "Alterations to these specific portions of the enhancer have the same effect as knocking the whole enhancer out altogether, suggesting that this could be a promising strategy to translate into the clinic." "Although fixing the sickle mutation itself would seem the most straightforward approach, it turns out that blood stem cells, the ultimate targets for this kind of therapy, are much more resistant to genetic repair than to genetic disruption," Bauer added. "Therefore, making a single DNA cut that breaks the enhancer solely in blood stem cells could be a much more feasible strategy."